Kathleen Ann Chalfant (née Bishop; born January 14, 1945) is an American actress. She has appeared in many stage plays, both on Broadway and Off-Broadway, as well as making guest appearances on television series, including the Law & Order franchise. Chalfant was born Kathleen Ann Bishop in San Francisco, California, and was raised in her parents' boarding house in Oakland. Her father, William Bishop, was an officer in the Coast Guard. She studied acting in New York with Wynn Handman, who was a protégé of Sanford Meisner and with Alessandro Fersen in Rome. Chalfant was nominated for her official Broadway debut role at the 1993 Tony Awards for Best Actress (Featured Role - Play) in Tony Kushner's Angels in America: Millennium Approaches. She earned the Outer Circle Critics, Drama Desk, Obie and Lucille Lortel awards for her performance as Vivian Bearing in Margaret Edson's Pulitzer Prize-winning play Wit in 1998; she shaved her head for the role. During her work with Wit, she incorporated her experiences dealing with terminal cancer of her half-brother, Alan Palmer, who died in 1998. She was presented with the 2018 Obie Award for Lifetime Achievement. In July 2018 she will read T.S. Eliot's Four Quartets at the Bard Summerscape Festival as part of a new performance with choreography by Pam Tanowitz, music by Kaija Saariaho, and images by Brice Marden. 1990 Tales from the Darkside: The Movie Dean Segment: "Lot 249"
1991 American Playhouse Mrs. Hauser "The Hollow Boy"
1992 L.A. Law Marlene Branson "Zo Long"
1997 Spin City Mother Superior "Hot in the City"
2000 The Beat Mrs. Waclawek "Someone to Watch Over Me"
2000 Law & Order: Special Victims Unit Mrs. Nash "Noncompliance"
2001 Law & Order: Criminal Intent Priscilla Van Acker "Smothered"
2001–09 Law & Order Lisa Cutler "Phobia", "Shrunk", "Illegitimate"
2007 Law & Order: Criminal Intent Bessie Holland "Bombshell"
2007 Law & Order: Special Victims Unit Judge Cutress "Haystack"
2009 Mercy Mrs. Borghouse "Can We Get That Drink Now?" 2012 NYC 22 Ginny Williams "Pilot"
2013 Elementary Mrs. Clennon "An Unnatural Arrangement"
2014 The Americans Aunt Helen "The Walk-In"
2014 Good Medicine Coco LaRue "Raj"
2014 Forever Gloria Carlyle "The Art of Murder"
2014–15 The Strain Abraham's Grandmother "Runaways", "BK, NY"
2014–15 Law & Order: Special Victims Unit President Roberts "Pornstar's Requiem", "Devastating Story"
2015–16 Madam Secretary Dean Ward "The Ninth Circle", "Unity Node", "Render Safe"
2019 High Maintenance Mamie "Fingerbutt"
1977 Westside Theatre Jules Feiffer's Hold Me! ^ Search: Kathleen Bishop at familytreelegends.com; accessed April 3, 2014. ^ California Birth Records info. ; accessed April 3, 2014. ^ Ryzik, Melena (May 20, 2007). "Nearly 60 Years and Counting, Working on the Art of Theater". Retrieved 24 April 2016. ^ Sturner, Lynda (24 March 2000). "Brit Wit". TheaterMania. Retrieved 24 April 2016. ^ "Demons: A Possession". Internet Off-Broadway Database. Lucille Lortel Foundation. Retrieved 24 April 2016. ^ "Cowboy Pictures". Internet Off-Broadway Database. Lucille Lortel Foundation. Retrieved 24 April 2016. ^ Lloyd Webber, Imogen (14 September 2015). "Kathleen Chalfant Will Headline Laurence Leamer's Rose Off-Broadway". Broadway.com. Retrieved 24 April 2016. ^ Vincent Canby (October 18, 1998). "Battered and Broken, So That She May Rise". The New York Times. Retrieved 2008-04-05. ^ Robin Pogrebin (October 20, 1998). "A Brother's Death Helps Bring a Performance to Life". The New York Times. Retrieved 2008-04-05. ^ Ben Brantley (April 7, 2003). "Life a Bit of a Mess? Just Carry On, Dear". The New York Times. Retrieved 2008-04-05. ^ "The People Speak". howardzinn.org. Retrieved 24 April 2016. ^ Bard College, Fisher Center for the Performing Arts. "Four Quartets at the Fisher Center". fishercenter.bard.edu. Retrieved 2018-07-03. 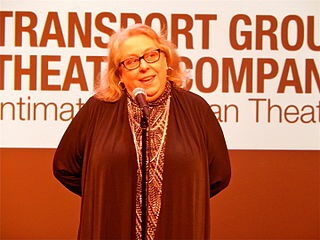 ^ Steketee, Martha Wade (4 April 2013). "Kathleen Chalfant: Practicing 'Political Performance'". Urban Excavations. Retrieved 24 April 2016. ^ "Kathleen Chalfant to Join Playwrights Panel on January 31". Aspen Institute. 29 January 2015. Retrieved 24 April 2016. ^ "Guantanamo Lawyers Panel with CCR's Gitanjali Gutierrez and actress Kathleen Chalfant". Center for Constitutional Rights. 30 August 2011. Retrieved 24 April 2016. ^ Norton, Ben (24 November 2015). "'Amplify your voice for justice': Roger Waters and prominent artists call for boycott of Israel in new video". Salon.com. Retrieved 24 April 2016. Lucille Lortel was an American actress, artistic director, and theatrical producer. In the course of her career Lortel produced or co-produced nearly 500 plays, five of which were nominated for Tony Awards: As Is by William M. Hoffman, Angels Fall by Lanford Wilson, Blood Knot by Athol Fugard, Mbongeni Ngema's Sarafina!, and A Walk in the Woods by Lee Blessing. She also produced Marc Blitzstein's adaptation of Bertolt Brecht and Kurt Weill's Threepenny Opera, a production which ran for seven years and according to The New York Times "caused such a sensation that it...put Off-Broadway on the map." Wit is a one-act play written by American playwright Margaret Edson, which won the 1999 Pulitzer Prize for Drama. Edson used her work experience in a hospital as part of the inspiration for her play. Annie Baker is an American playwright and teacher who won the 2014 Pulitzer Prize for her play The Flick. Among her works are the Shirley, Vermont plays, which take place in the fictional town of Shirley: Circle Mirror Transformation, Body Awareness, and The Aliens. She was named a MacArthur Fellow for 2017.